Rio Salado College | RioNews: Meet the 2018 Constitution Contest Winners! Meet the 2018 Constitution Contest Winners! The results of our 2018 Constitution Day contest are in! The contest called on students to answer this question: “Describe how the First Amendment of the Constitution enhances diversity in the United States.” The prize—a $75 gift card! 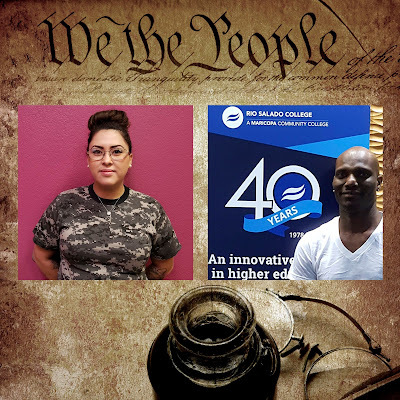 Essay by Damian Robinson, Rio Salado Thomas GED® test prep student. Poem Please Excuse My Freedom of Speech by Margie Munoz, Rio Salado Thomas GED® test prep student. Multimedia presentation, My Journey to Freedom by an anonymous student taking English as a second language classes at Rio Salado. We thank all of the Constitution Day contest winners and participants for sharing their thoughtful and poignant narratives. We encourage you to take pause to think about what the Constitution means to you! Pictured above are Margie Munoz and Damian Robinson.